The San Luis Valley Irrigation District and Rio Grande Reservoir is one of the biggest success stories to ever emerge from the Rio Grande Basin. As a key provider of water from critical sources to the San Luis Valley and beyond, this district plays a pivotal role in the water delivery cycle that stretches all the way to Mexico. SLVID is the keeper of the gateway for the Rio Grande. Originally formed on December 8th, 1908 as a result of the Irrigation Act of 1905, the San Luis Valley Irrigation District continues to serve water users over 100 years later. SLVID is governed by a board of directors that is composed of five elected members. The current board is led by president Randall Palmgren. The district encompasses portions of Rio Grande, Saguache and Alamosa Counties with the headquarters being in Saguache County (Center). Quite simply, SLVID exists to serve the famers who reside in the counties it is made of. SLVID delivers water to 62,000 acres of highly productive farmground in the Center-Hooper areas. Crops that are produced within district boundaries include fresh market potatoes, Coors barley, and dairy quality alfalfa. 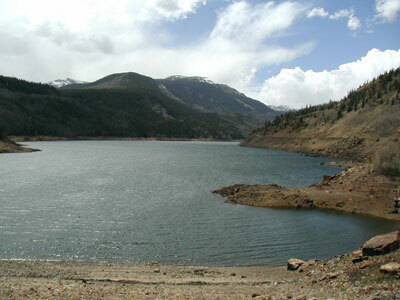 One of the key assets that SLVID possesses is the Rio Grande Reservoir. In 1888, farmers near the Center-Hooper area established the Farmer’s Union Irrigation Company. The intent was to build a canal system that could deliver irrigation water to 90,000 acres. The Farmer’s Union Canal became a reality. However, the need for a secondary source of water quickly became apparent for the control of these deliveries and the insufficient amount of water that the canal was delivering because it had a junior water right. Due to an embargo from the federal government which prevented any new dams/reservoirs from being constructed on the Rio Grande this initiative was put on hold. The present site of the reservoir was purchased from A.V. Tabor who had claimed it in 1903. The construction plans began in earnest once the embargo was lifted in 1907. In 1908, the process of forming the San Luis Valley Irrigation District began in order to raise the additional capital that would be needed for construction. The first board of directors took shape. On June 10th, 1910, the San Luis Valley Irrigation District signed a contract for construction of a dam and spillway with Ellswoth, Knowles, and Klaner of Pueblo. An engineer by the name of J.C. Ulrich drew the plans and specifications and was hired as the project supervisor. The tunnel was drilled in 1910. By 1912, Rio Grande Reservoir was storing water. The dam and spillway were fully completed by September of 1913 and the reservoir was full by June 16th, 1914. The result was a reservoir that is still standing after over 100 years that continues to deliver water for agricultural needs, serve as a tool for compliance with the Rio Grande Compact, and aid for fish and wildlife habitat, recreation and flood control. Age can bring the necessity for repairs and Rio Grande Reservoir was/is certainly no exception. The dam and spillway began to be in need of repairs. Out of this necessity resulted the Rio Grande Cooperative Project. This project is a public-private partnership that was established in 2002 when the SLVID board of directors recognized the need to address the dam safety issues of the Rio Grande Reservoir. In 2003, a Yield Analysis Study to find what benefits would be obtained from improved storage and release was conducted with the assistance of a $25,000 contribution from the San Luis Valley Water Conservancy District. 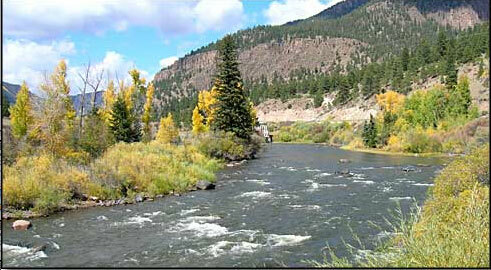 In 2005, SLVID was awarded Rehabilitation Study Grant from the Colorado Water Conservation Board. Another grant came in 2007 for $230,000 from the Rio Grande Roundtable for a rehabilitation and enlargement study. In 2008, SLVID received another $100,000 grant for the development of an operations model. Finally, in 2011 the Rio Grande Cooperative Project became official and plans were underway. In 2012, the Colorado General Assembly passed the Colorado Water Conservation Board Projects Bill which included a funding package for the repairs of Rio Grande and Beaver Reservoir. Phase 1 of the Rio Grande Cooperative Project began following the 100th Anniversary of Rio Grande Reservoir. The Dam at Rio Grande was completely resurfaced to address seepage issues and saw completion in the fall of 2013. Repairs of the Beaver Reservoir Dam also took place. This monumental task was accomplished in spite of obstacles such as the West Fork Complex Fire. The Rio Grande Cooperative Project continues to move forward with Phase 2 which is the repair of the outlet tunnel at Rio Grande Reservoir. The partners in this project are The San Luis Valley Irrigation District, Colorado Parks and Wildlife, and the Colorado Water Conservation Board. The main purpose of the cooperative project is to optimize the use of available water through the reoperating and retiming of the reservoirs owned by the partners. Additionally, volunteer efforts have aided in the use of compact storage for the native trout species to adjust to water level changes and the benefit to recreation. Methods that were dismissed before are now being put to use and the larger water community is now profiting from the results. Travis Smith, superintendent of SLVID has observed that it is about “culture change” and addressing how needs can be met. The story of the San Luis Valley Irrigation District continues to unfold, but there are many great chapters that have already been written. SLVID continues to be a mainstay for San Luis Valley water. Is the seepage at Rio Grande Reservoir under the jurisdiction of the USFS or a water rights question? A pair of environmental groups are challenging a proposed land exchange by the U.S. Forest Service that would assist with repairs to the San Luis Valley’s biggest reservoir. The Forest Service would exchange 6 acres of federal land with the San Luis Valley Irrigation District that would help the district repair the 103-year-old Rio Grande Reservoir in return for 8 acres of private land. As part of the package, the irrigation district also has offered to sell the agency a 23-acre inholding on the Weminuche Wilderness for $1 and grant a 1,400-foot trail easement. Jen Pelz, the wild rivers program director for WildEarth Guardians, said the groups do not object to the dam repairs. They do, however, want the Forest Service to better analyze the impact from eliminating seepage at the dam, which ranges from zero to 6 cubic-feet-persecond, and mitigate the impact to fish and wildlife on the river segment below the dam. Mike Blakeman, a public affairs officer for the Rio Grande National Forest, said the criticism of the agency’s analysis of the seepage was off base. He added that the seepage also was part of the irrigation district’s water right that also was not subject to agency authority. The reservoir, which sits roughly 20 miles west of Creede on the Rio Grande, assists the irrigation district in delivering water to roughly 70,000 acres of farm ground in the northern half of the valley. The 54,000-acre-foot reservoir also plays a key role in helping water officials time deliveries to comply with the Rio Grande Compact and mitigate the impact to the river from groundwater pumping on the valley floor. Resolution of the objection by WildEarth and Western Lands Project now sits with officials at the agency’s regional office in Denver. The resolution period started Tuesday and could take anywhere from 45 to 75 days. This 100th anniversary is a time to capture for a few moments, the vision of people like Frank Sylvester, David Miles, S.J. Schoonover and Charles Speiser who, in October of 1908, formed the San Luis Valley Irrigation District under authority of the newly created Irrigation District Statute of 1905 from the former Farmers Union Irrigation Company. The Farmers Union Irrigation Company was formed in the late 1880’s as a mutual ditch company to provide irrigation water to the lands near Center, and extending eastward to Hooper. The Farmers Union Canal is a junior canal, and its priorities did not provide for a reliable water supply. Frank Sylvester and the Farmers Union Board recognized in the early 1890’s the need for a reservoir to provide a more reliable water supply. Discussions of building Rio Grande Reservoir began in 1892, with a preliminary survey during 1905 -1907; plans of site purchases, reservoir design, and how to finance such a large and bold undertaking. The board of the newly formed San Luis Valley Irrigation District, in 1908, moved quickly to secure funding for the actual construction of the reservoir at the headwaters of the Rio Grande by issuing bonds worth $530,000. The reservoir site was purchased from a Creede entrepreneur named A.V. Tabor. Engineering work including test pits and surveying began in 1907. The tunnel was drilled and completed by 1910 and the outlet was installed soon after. In June of 1912 the reservoir stored and released water to be used beneficially on District lands while the dam was being completed to establish a storage right. Rio Grande Reservoir is now preparing for the future by honoring those who made the first 100 years possible. The San Luis Valley Irrigation District is pleased to celebrate Rio Grande Reservoir’s 100th Anniversary on August 23, 2012 at the reservoir. In celebration of the 100th anniversary of the Rio Grande Reservoir, Water 2012 in the Rio Grande Basin invites everyone interested in the early history of water in the San Luis Valley to take a caravan tour of the historic Rio Grande Reservoir on Saturday, July 14th, 2012. The tour is co-sponsored by the San Luis Valley Irrigation District, the Colorado Field Institute and the Rio Grande Inter-basin Roundtable. Hosts of the tour include Travis Smith of the San Luis Valley Irrigation District and other special guests. The theme for the Reservoir’s 100th Anniversary is the past, present and future of Rio Grande Reservoir. A walking tour of the Reservoir and a presentation of the Rio Grande Cooperative Project will be made. Construction on the Rio Grande Reservoir began in 1912 and was completed in 1914. The reservoir provides storage for agricultural needs and is used for compact compliance, fish and wildlife habitat, recreation, and flood control. Rio Grande Reservoir has been in operation since 1912 as the only pre- compact on channel reservoir on the Rio Grande main stem. The reservoir has endured many issues during the last 100 years including many facelifts. Rio Grande Reservoir represents the vision and determination of the Landowners of the San Luis Valley Irrigation District. The tour will begin in South Fork at the Visitors Center. The group will meet there at 10:30 a.m. and caravan up to the Rio Grande Reservoir via Highway 149. The tour will arrive at the reservoir at 11:30 a.m. From 11:30 a.m. to 12:30 p.m., there will be a walking tour of the reservoir. From 12:30-2 p.m., lunch will be served and the San Luis Valley Irrigation District will give a presentation on the history of the reservoir. Lunch will be provided by the San Luis Valley Irrigation District. Remember, Rio Grande Reservoir is in the high country (approximately 10,000 ft) please bring a light jacket and a hat. The tour will be capped at 30 people and all participants must register online at http://www.rgwcei.org, http://www.water2012.org, or http://www.coloradofieldinstitute.org. To register, click on “Calendar of Events” , select “July 14th Tour” and follow the registration instructions. Beaver Creek Reservoir, which sits roughly five miles south of South Fork, currently can store only half its capacity of 4,400 acre-feet. The development of a sinkhole last year forced the reservoir to be drained down. A key aspect of this proposal is that the DOW is looking at partnering on the reservoir repairs so it can store up to 5,000 acre-feet at Rio Grande Reservoir. That amount of storage in the Rio Grande’s only on-channel reservoir could give the DOW more flexibility in how it moves both water from the basin and transmountain water, said Tom Spezze, a DOW regional director. The DOW, which is the largest holder of water rights in the valley, uses the water to enhance habitat for fish, waterfowl and other wildlife and to increase hunting and fishing opportunities. The repairs also would benefit agriculture because the irrigation district delivers water to roughly 60,000 acres of farm ground in the north-central part of the valley. More Rio Grand River basin coverage here. Cotten said this is the first year the new irrigation policy has been in effect, so it is a learning process for his office as well as irrigators. This is also the first year well users have to follow the same irrigation season as surface water users. To get that kind of flow, the reservoir would need to be full, and the reservoir reach its full capacity without rehabilitation, DiNatale explained. Increasing the amount of water in the reservoir would take cooperation from various entities, he added. For example, the reservoir could store water for the Rio Grande Compact, Division of Wildlife, sub-districts and other groups. Reservoir rehab would cost about $22 million, Smith said. Reservoir rehabilitation would involve construction of a new outlet, enhancement of the spillway and correction of a seepage problem. With another approximately $8 million the rehabilitated reservoir capacity could be expanded by another 10,000 acre feet, according to Smith.